Organic food is not new to India. In fact it was the food that our grandparents and ancestors ate. Collecting grains grown in farms without chemicals and pesticides and getting the grains milled into flour using the traditional chakki (grinding stone) was a way of life with our predecessors. And a lot of women had these grinding stones at home which gave them fresh, stone ground flour and also kept them in shape as they had to put in a certain amount of physical effort to get the job done. I have been using organic flour for a number of years from Vandana Shiva’s Navdanya. But for this recipe, I tested it using 24 mantra organic wheat flour which is also made from stone ground chakki (mill), just the way our ancestors made it. When it comes to wheat, it is important to select flour made from non gmo wheat and when the wheat berries are stone ground, you will notice the unique flavor and taste of bread made from such type of flour. Replacing organic wheat flour with regular flour leads to overall health and research also shows that it prevents many wheat borne diseases. It also helps if you know where your organic food is coming from and to ensure that it is from a reliable source. My mother in law is quite a perfectionist and this attribute reflects in her impeccably kept home, garden and kitchen. She also happens to make perfect puris and she learned how to make them, from her mother. I was always fascinated with the way she made puris and the way her guests devoured them, so this time I was fortunate to document the fine art of making puris. 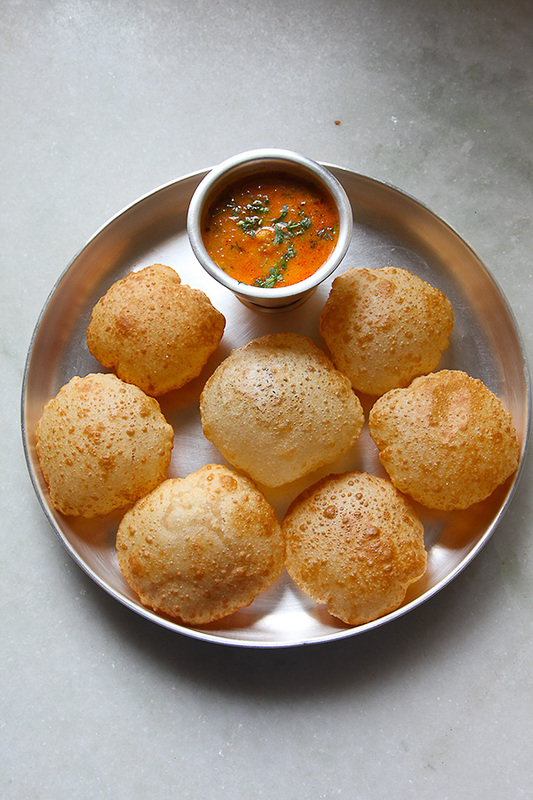 So today I’m here to share with you my family recipe for making the perfect puris that don’t deflate and retain their shape from the frying pan to the plate. And they are perfect with any vegetable, curry, jam, chutney or even desserts like shrikhand and aamras. Infact the combination of eating puris with shrikhand or aamras is the stuff legends are made of. Many regional stories abound, describing the passion and fervor with which these dishes were made and relished. 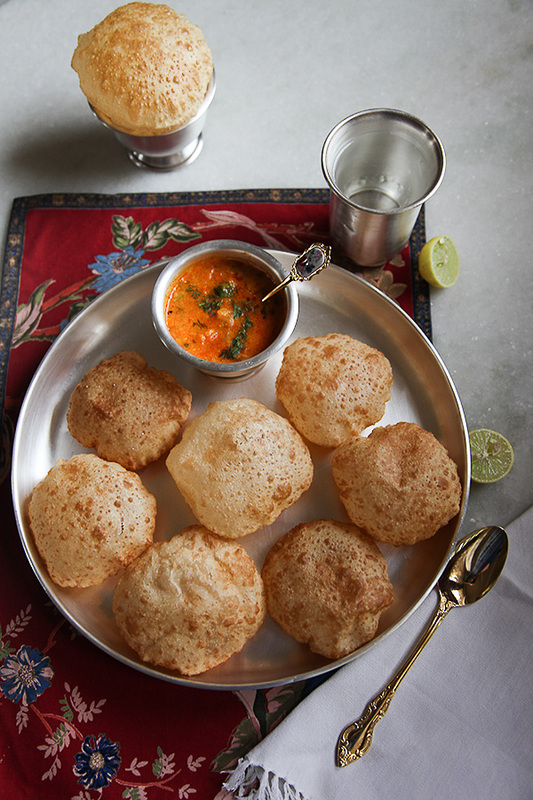 When mangoes are in season puri and aamras is made to celebrate and enjoy many occasions. My husband tells me that this was his favourite combination and his mother never failed to make it on his birthday every year, along with other delicacies. Since mangoes were not in season, raswale aloo was made and served with hot puris. There are many differences between a chapatti dough and a puri dough. Fat in the form of oil or ghee is always rubbed into a puri dough, less liquid is added to make a stiffer dough and flour is never used to roll the puris into perfect discs. 1. Use the best possible flour available to you. 2. 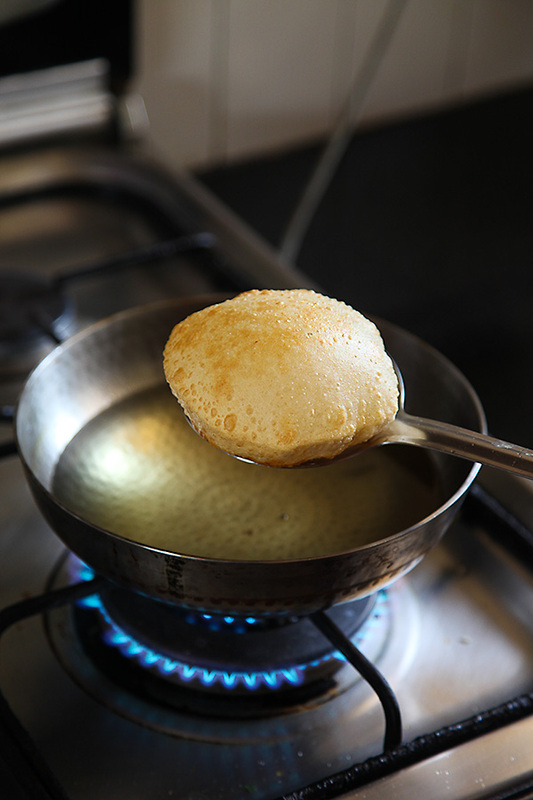 Always mix in hot oil or ghee into the flour (this helps the puris to puff up). 3. Never use flour to roll the dough. Grease the rolling pin and the rolling surface, instead. 4. Never allow the oil or ghee to smoke. Although puris are best served hot along with any savoury or sweet side, they can also be enjoyed cold. Puris make a great snack for long distance travel, picnics or alfresco brunches, lunches and dinners. Disclaimer: This post is sponsored by the good folks at 24 mantra organic. To know more, follow the Organic Mantras initiative with 24 Mantra organic on Facebook and Instagram. 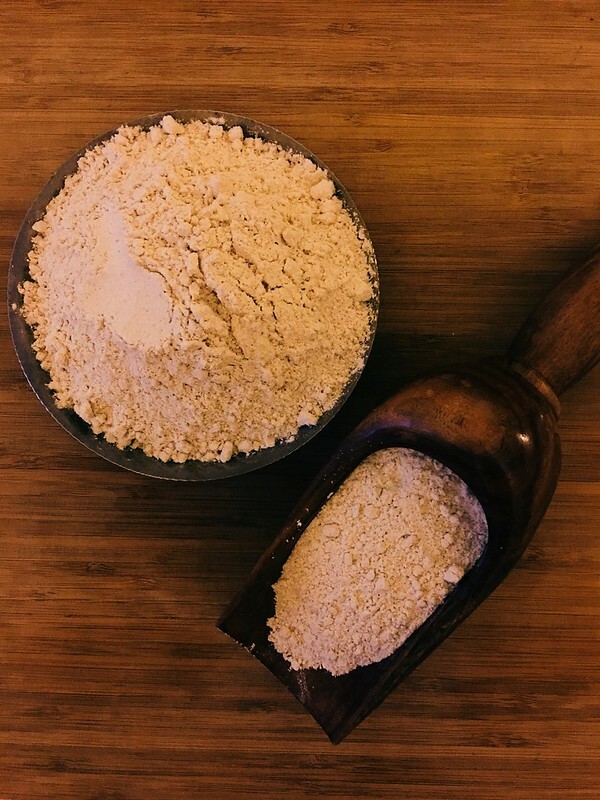 In a large bowl, assemble the wholewheat flour, the plain flour, fine semolina, chickpea flour, sugar and salt. Mix well with a spoon or with your hands to bring all the dry ingredients together and then mix in the hot oil. Rub the oil into the flour. Put in the milk or water into the flour and knead for 5 to 6 minutes to make a stiff dough. Allow the dough to rest for 30 minutes to an hour or more. 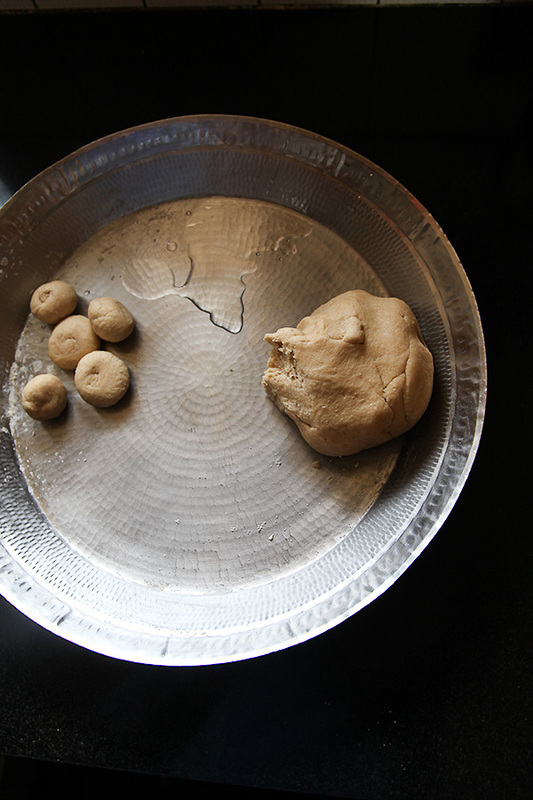 After the dough rests, knead it briefly and divide the dough into small portions. 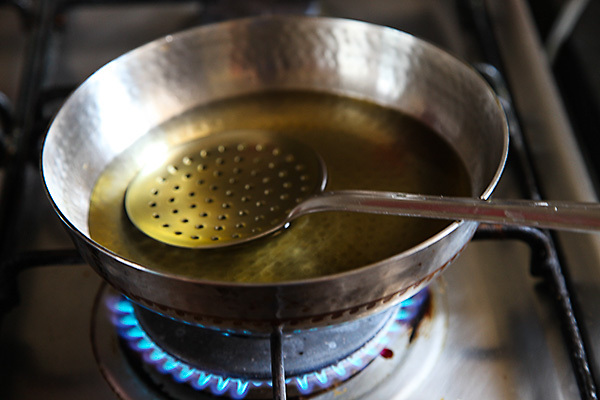 In a small wok or kadhai, heat , put the oil or ghee on low heat. In the meanwhile, roll the balls using a rolling pin. You can smear some oil on the rolling pin and the rolling surface to prevent the dough from sticking. Increase the heat of the oil and allow it to get hot. Make sure that you do not allow the oil to smoke. After the oil is hot, carefully place the rolled disc into the hot oil. 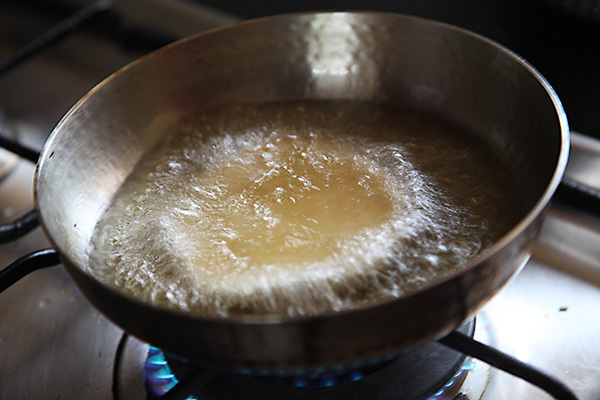 The puri first sinks into the oil and then begins to come to the surface. You need to hold the puri with a slotted spoon, until it puffs up. After the puri puffs up and turns a golden brown you need to flip it over and cook until the other side is golden as well. 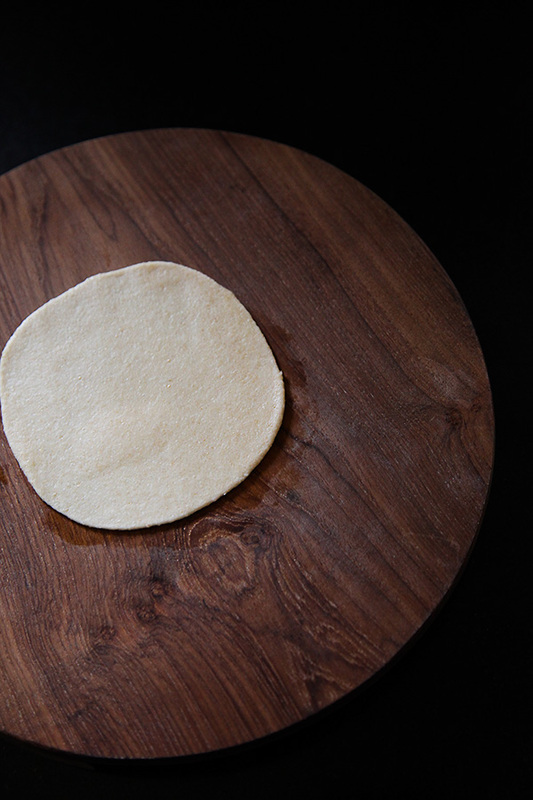 Take the puri out and place it on a large plate lined with absorbent paper. Serve hot with practically any vegetable, curry, shrikhand or aamras. I truly adore the props that you use in all of your delicacies. Puris look quite tempting. My son desires me to cook Puris for this birthday (Early November). I'll surely refer to this puri recipe. All your recipes are certainly a keeper. Hatz off to you!! Thank you. Priya- Thank you. Let me know how you liked the puris. I always wondered how the puris you get in hotels don't deflate while serving. Now I know how to make such puris at home, thanks to you Anu. 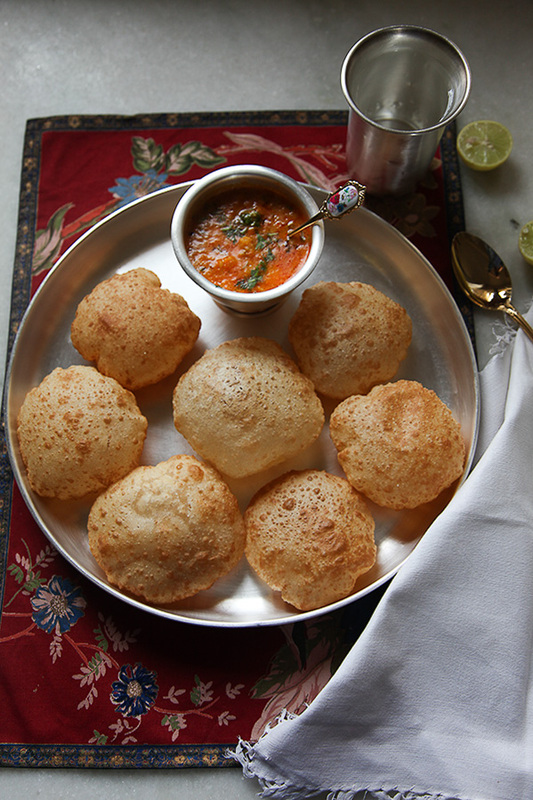 The delight on my husband's face when I made these puffed puris which remained puffed was so rewarding to me! He actually saw me referring to your recipe while preparing the puris and he teased me saying I didn't even know to make puris. 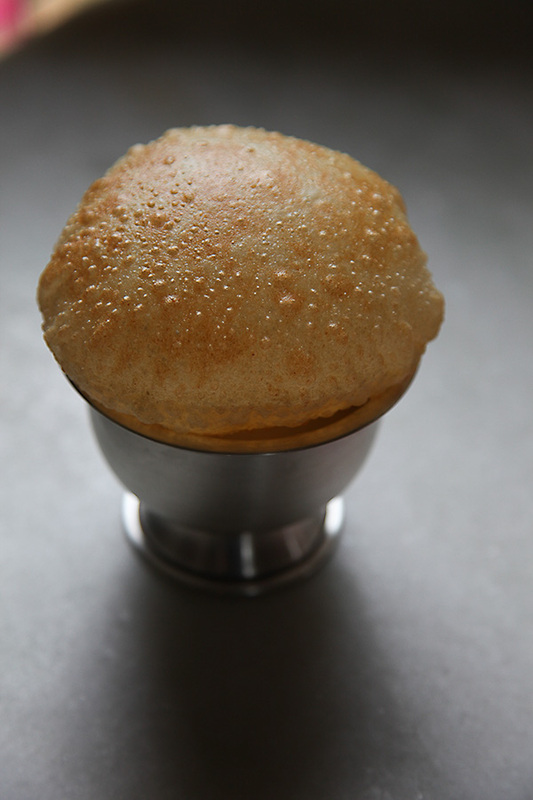 Later on I had the opportunity to gleefully declare that I had learnt the secret of puffed puris from your recipe. I wanted to ask if maida is essential towards getting puffed puris or sooji alone would do the trick? Thanks a lot. 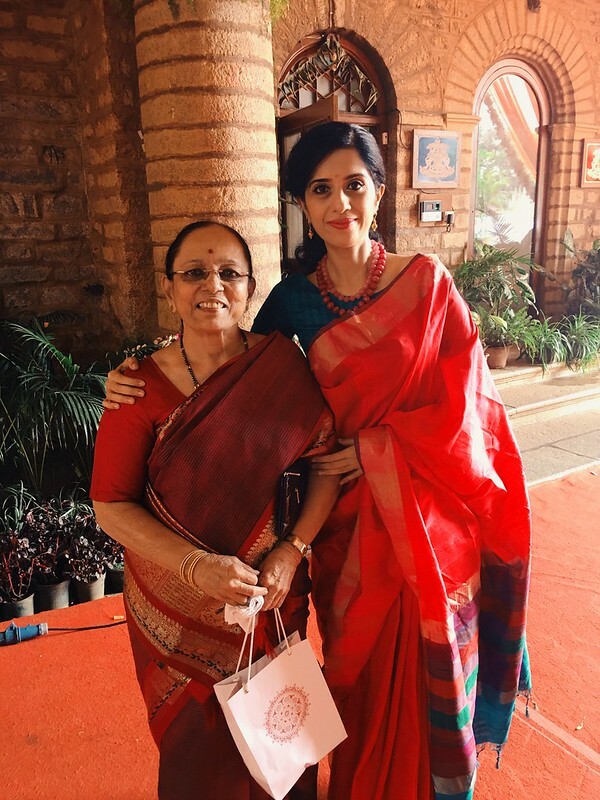 jayashree- Happy to hear this. 🙂 Maida gives a light texture to the puris. Only whole wheat will make them dense.